We saw a short video and also still images grabbed from the video, on a previous page (see Mountain Horse Gait Video), of a mountain horse's gait, in an exercise to determine what gait he was doing. The gait was stepping pace. The pictures below will help to show what to look for in the timing of the legs. The first picture is the mountain horse (unknown breed, but gaited). 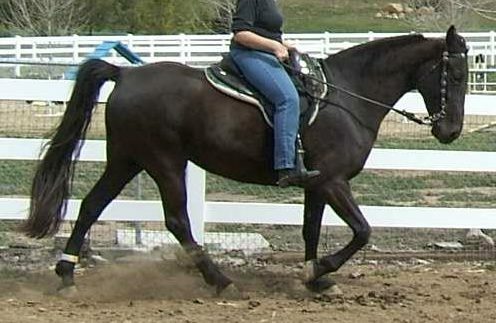 The second picture is a registered Tennessee Walking Horse, doing an evenly timed gait. 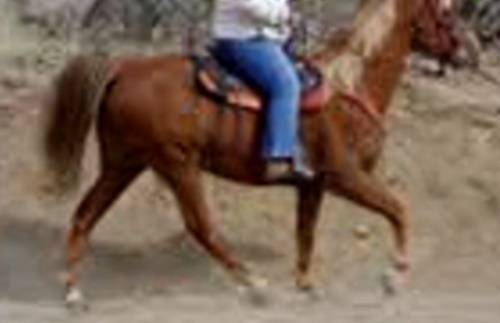 Each picture shows the respective horse at full weight-bearing position on the left front leg. We'll use this leg as a reference point for the other legs. With the mountain horse, his left hind is at relatively the same angle as the left front. It is leaning forward slightly, a smidgeon past it's full weight-bearing position. The black mare in the second picture has her left hind at more of an angle than the left front. Looking at the right legs of each horse, in relation to the left front weight-bearing leg, you will see that the right laterals of the mountain horse are both airborn. The right rear of the black mare has just landed and is in the process of accepting weight. The right front of the mountain horse is more advanced in it's swing than the right front of the black mare. The right front of the mountain horse will land soon after the left hind; resulting in laterals that are closer in timing: 1-2--3-4. In comparison to the black mare, her footfall is more evenly timed, at 1-2-3-4. The frame of each horse is different, as the mountain horse has it's head up, lowering the base of it's neck, going into a ventroflexed or hollow frame, whereas the black mare's head and neck are lowered, resulting in a more neutral frame.